I quickly want to do an update on the crafty front. I'm trying to make sure I blog about my crafts - this IS the CraftyHope blog. 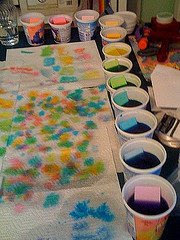 I really want to make my crafts more of a priority on this blog and in my life. Geez, I dunno if some of the people in my life will be able to handle more crafts in my life. So, I've switched crafty obsessions again and am currently making paper flowers. I may go into my process at another time but not right now. It's a craft of my own invention, and I have not perfected it yet. This is the back of the tags. It's just some pretty cardstock/scrapbook paper that I punched out and glued to the back of the tags for stability. 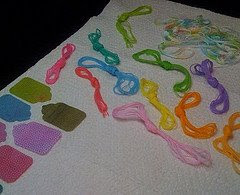 I dyed some string (see above photo) also that I will use on the tags. I'm still in the gluing and drying process as I just finished dyeing the other day. I dyed just about everything I could get my hands on. Note: I kept the dye in yogurt containers with lids. This kept well for a few days so I could take breaks and go to work. But after a week or so, a few of the dye colors began to fade. Hopefully I will finish these soon, but (like I said) I'm obsessed with paper flowers right now. On another crafty note, I think I've mentioned it before - I constantly carry a 'craft bag' with me to soothe immediate crafting urges. In my craft bag today: sharpies, clear shrink plastic, travel watercolors, sketch book, tags to be glued, string for tags, small hole punch, glue stick, brayer, and a clipboard (as always). Alright, I may post more tag pictures when I actually get them done. For now, I need to get back to work. I just wanted to remind everyone why I am Crafty Hope. I hope this helped.